TUALATIN — The Bowmen are ready. They're all ready to battle. The Sherwood, Tigard and Tualatin high school wresting teams, as well as the other squads in the Three Rivers League, will be competing for league supremacy, as well as state tourney berths, when they take part in the Three Rivers League district tournament, which will be held Friday and Saturday at Tualatin High School. "We're excited with the potential we have heading into district," Tigard senior Jacob Beck said during the Tigard Tournament back on Jan. 20. "It's going to be about what happens that day." "I'm ready for district," Tigard junior Emilio Jimenez said. "I'm ready to go." Action at the Three Rivers League district tournament is set to start at 2 p.m. on Friday. On Saturday, wrestling starts at 10 a.m. with the championship bracket semifinals. The Parade of Champions, and the title matches, are slated to begin at 6 p.m on Saturday. The top four placers in each weight class at the district tournament will advance to compete at the Class 6A state tournament, which will be held Feb. 16-17 at Portland's Veterans Memorial Coliseum. Sherwood, Tigard and Tualatin will all be looking to send as many wrestlers as they can to the state event. 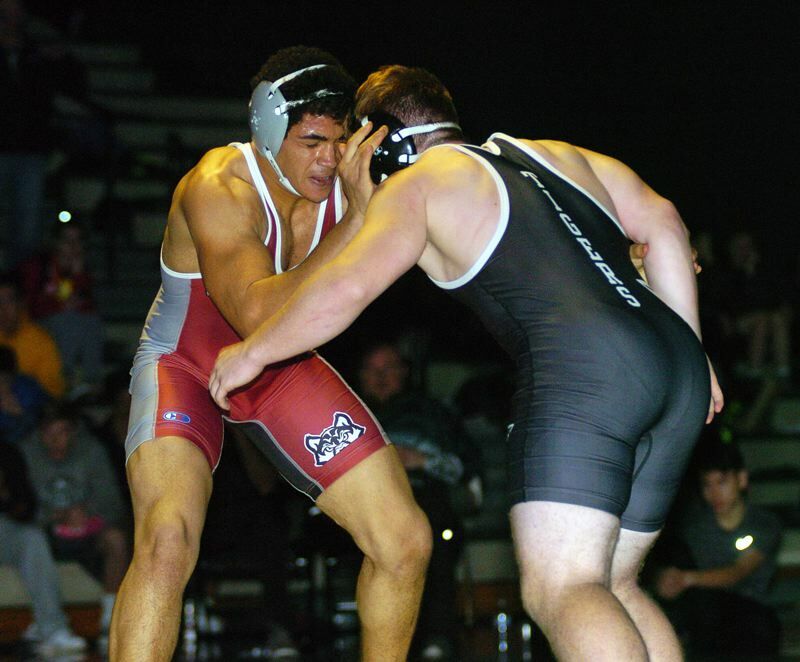 Leading the way for the Bowmen at the district tournament will be junior Gaven Jolley, who is a two-time defending district and state champion. Last year, Jolley won district and state crowns at 120 pounds. He'll be wrestling at 126 this year. Among the other top wrestlers for Sherwood at the upcoming district event include senior Jack Murphy at 120, sophomores Philip Resch and Bram Nelson at 132, junior Andrew Fujii at 138, senior Andrew Mabry at 145, senior Rustin Williams at 182, junior Jackson Barton at 220 and senior Jayden Cuthbertson at 285. "Hopefully, they'll all make it to state," Sherwood coach Jeff Wilson said. "And we've got a lot of younger kids looking to make it to state." Murphy, Mabry and Williams, as well as Jolley, are all looking for a return trip to state. "Getting back to state is a goal," Murphy said during the Bowmen's TRL dual match with West Linn on Jan. 18. "I want it." For Tigard, some of the top competitors going into the district meet look to be junior Killian Ryan at 120, Jimenez at 132, senior Cole McCallister at 152, Beck at 182 and junior Javier Velasquez at 285. "We're excited and ready to go," Tigard coach Geoff Jarman said. "If we wrestle well, I think we could send six, or so, to state." Beck is the defending district champion at 182. Ryan, Jimenez and McCallister are also looking for return trips to the state tournament. "We're working hard," McCallister said. Tualatin has a defending district champion in junior Sami Victoriano. Last year, Victoriano won the TRL crown at 113. He'll likely be at 120 for this year's tournament. Timberwolf senior Jarius Jackson (likely at 195), junior Justin DiCola (170) and junior Gavin Moore (220) will also be looking for return trips to the state tournament. Newberg, which went 7-0 during the TRL dual match season, and West Linn, which went 6-1, look to be the favorites for the league district team title.